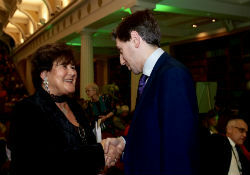 WHO Regional Director for Europe Dr Zsuzsanna Jakab and Irish Minister for Health Simon Harris at the Fourth Global Forum on Human Resources for Health in Dublin. More than 1000 leaders, planners and practitioners from the health, labour, education and finance sectors gathered at the Fourth Global Forum on Human Resources for Health in Dublin, Ireland, on 13–17 November 2017. Together they promoted innovations for building a health workforce for the future. Delegates at the Forum endorsed the Dublin Declaration to show their collective commitment to developing the health workforce required to achieve the United Nations Sustainable Development Goals. WHO/Europe used the opportunity of the Forum to present the first version of a toolkit developed to support Member States in their efforts to create a fit-for-purpose and sustainable health workforce that can address current and future health needs. It presented this new resource at a working session on 15 November to a gathering of policy-makers, investors, leaders and planners. The toolkit provides structured access to planning tools, case studies and evidence. It will support countries’ implementation of the framework for action towards a sustainable health workforce, adopted at the 67th session of the WHO Regional Committee for Europe in September 2017.